Kanye digs pitch correction software. And naked women. Kanye West has celebrated the upcoming release of new album 808s & Heartbreak by hosting a lavish launch party. Thrown in Los Angeles, the shindig was organised in collaboration with Italian artist Vanessa Beecroft, and was enlivened by the presence of around 50 naked women (purely in the name of art, you understand). Oh, and those who attended got to listen to the new record, too. Reports suggest that the majority of the tracks on 808s and Heartbreak make heavy use of Antares Auto-Tune - we've already heard it on lead single Love Lockdown - and this has been confirmed by Mike Dean, one of the men who's mixing it. "We were working on the remixes for [ Lil Wayne's Lollipop and Young Jeezy's Put On,] and he [Kanye] fell in love with the Auto-Tune," Dean told MTV. 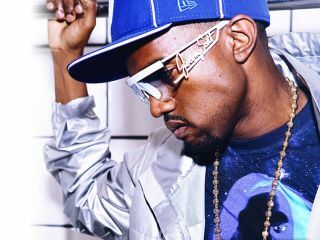 The producer also revealed that Kanye imposed a rule when he was making the new record: "Every song has got to have an 808 in it." You can listen to and download Heartless, a track from the album, on Kanye's blog, though the star points out that this is an unmastered version. Be aware, though, that the post also contains photos of the aforementioned girls from the launch party, so might not be safe for work. 808s & Heartbreak will be released on November 25.